Having just attended BRIGDA forum held over the weekend, I found a vibrant scene of local independent developers both rising and established. This was a great relief to me as I plug away at my computer with little contact with other developers other than online (and even then, not nearly enough as I should), I think I needed to see and hear other developers who have found a space for themselves to do what they are passionate about, making games. With a theme of “What if…?” the program of panelists tackled questions about where games were going into the future and how stories from developers who have struck out on there own. Also refreshingly there was discussion about the health (both physical and mental) of gamers and devs, which is an issue that effects almost everyone, whether directly or someone they know. The afternoon industry discussion from industry veterans Matt Hall (Hipster Whale), and Luke Muscat, Phil Larsen, Hugh Walkers (Pretty Great Studios) offering an insight into the industry, how they operate when making games, and striking out on there own. It was heartening to see and hear local successes such as this, and to realise that although still a dream, making games for a living may actually be possible. Having come back from a mid year holiday I was keen to try a game jam to get some ideas flowing. Luckily I stumbled upon the GameJolt website which was hosting an online 72 hr game jam the very next day. Having prepared myself with lots of coffee, and an update of Unity, the theme was announced: Arcade. 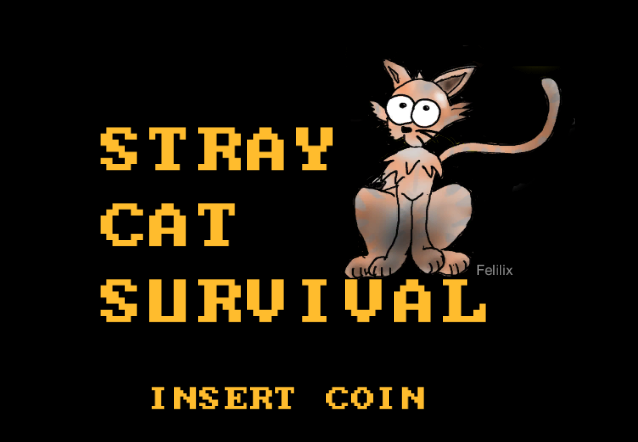 My brainstorming took a few hours to come up with the general gameplay mechanics of a cat in a room, with vacuum cleaners to avoid, food to collect, and increasing difficulty, with the goal of gaining the highest score and level. I created some placeholder artwork and made a simple movement system to get a feel for the game, before creating final character art and applying it to animations and improving the movement system. I used the inbuilt physics system of Unity and found some cheap and nasty ways of restricting speed, and to rotate towards the direction of travel. It’s not pretty, but functionality was the key if I was going to come close to the deadline. When I was happy as I could be with the player movement and animation speed ( I finally got a variable animation speed based on velocity, not too shabby!) I then moved onto the vacuum cleaner AI. I didn’t want the vacuum to target the player initialy so I made an AI with a simple movement system, (when it hits walls it stops, reverses, rotates, continues…) and kept developing it and tweaking was happy, after thinking about it, and I also added another enemy AI which follows the player relentlessly, and made them different colours. 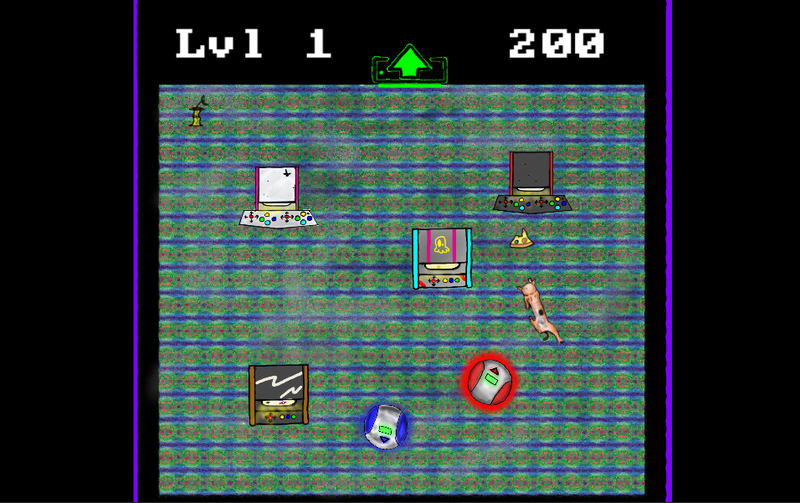 Finally I was onto the main game loop, which at the start of evey level sets up the arcade machines, fruit and enemies in random locations. For enemy numbers I used A logarithmic function to ramp up the numbers in relation to the current level, as was used in the unity rogue like tutorial, and had been thinking about since. I used a variety of methods to spawn objects, from if statements, to using loops and lists, and simple random placement of food within the room bounds. Using lists was by far the fastest to code, and I guess doing a jam like this forces you to find more efficient processes. One of the contest rules was that the game had to integrate the GameLoft API in order to qualify (so that gamers could then compete against each other for highscores during the contest). Unfortunately as I had never uploaded and tested uploading a game on GameLoft (which I should have spent more time if I had of known about the contest earlier), with 10 minutes to go I got my game uploaded, only to find it doesn’t work due to an issue with WebGL. Overall though I am happy to have entered, I learnt a lot, and got to spend much more time on the creating art, which I’m starting to really love. I can’t wait for the next Jam, hopefully with a team next time!